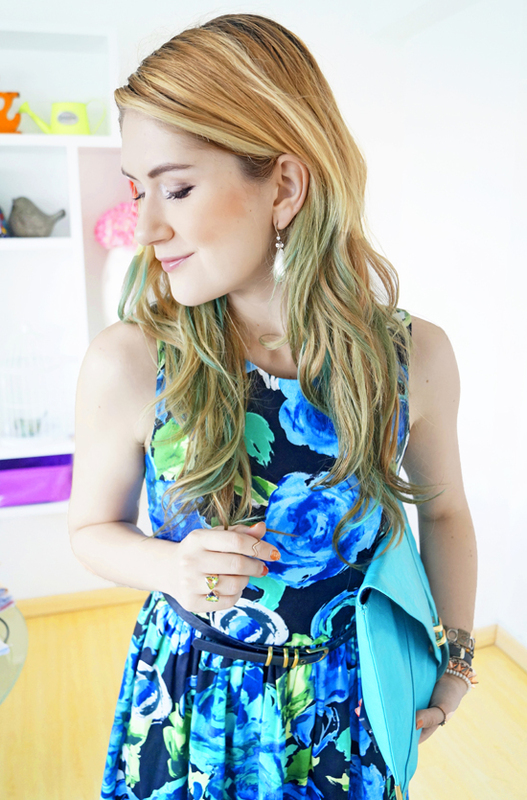 En Español- Aquí les dejo un post cortito para mostrarles este outfit lindo que me puse para combinar (una vez más) con mi pelo azul! En verdad a mí me encantan los vestiditos de verano, sobre todo porque son tan fáciles de combinar con otras cosas. Con solo usar unos zapatitos lindos y una bolsa colorida ya tengo un outfit completo! What are your go-to pieces for making easy outfits? Qué te gusta ponerte a tí cuando quieres hacer un outfit rápido y fácil? that is such a pretty sundress and not only do you look fabulous in it, it goes well with your new hair color (which is very cute i must add)! I agree dresses are quite easy to style. Skinny Jeans and a blouse are usually my go to outfit- simple and easy! Aw I love the blue in your hair and how perfectly it goes with your cute little dress! Comfy dresses with cardigans are usually my go-to outfits when I don't really know what to wear. I like ur floral dress, the blue fits u darling! Oh wow, that's such a beautiful dress, Marie! It's such an electric shade of blue... and the material looks so nice, too! I love how you piled on more blue with the clutch, too. Blue is so you~ and that rhymed! Most likely not but if you do decide to part ways with this dress, send it my way Marie. It's a "never fail" choice! You just have to find the shades that suit you (just like you did)! Thank you Jody!!! I've really been enjoying more simple outfits lately of just a pretty dress and neutral accessories. Glad to hear you are a big fan of sundresses as well! Thank youuu!!! I'm glad to hear we both love sundresses. I find them so much easier than jumpers and trousers as well. Hahahahaha Oh Ali, you even make rhymes too?! You are too awesome for words!! Lol, it is pretty peculiar that your go-to piece are red ankle socks!!! You are so unique and I love that about you! Thank you Irene, I appreciate it! Thank you so much Jamie!!! Dresses with cardigans are a great combo on the go!! Thank you Heidi!!! When I want to wear something super comfy and easy to move around with, I also go with skinny jeans and a blouse. Great go-to combo! Aaaww you are too sweet Mark, thank you so much! Ouu your dress is absolutely gorgeous Marie! I love the blue in your hair, it looks so fun, not to mention how perfect it looks with your ensemble! Your nails are so cute too, love the colour! But I think I liked the pink chalk better.